This month, during a couple visits to Whole Foods, I picked up some indoor pots of hellebores that were on sale. Considering that they are pricey to order, I have the enjoyment of blooms on my windowsill, and later (hopefully), three new hellebores to put into my garden this year -all for a sale price. These are true Christmas roses(H. niger), while the one that has been growing in my garden for years is a “Lenten rose” (H. orientalis) with dusky maroon spots and shadings. I don’t know why I like hellebores so much, they bloom when I have little to do with my garden, and the ones outside are very shy; but they are very fine indoor plants, at least so far. Now that I’m thinking about it, I should transplant a start of those to a more visible and prominent place. In the potting soil my new plants droop when dry, but a splash of rejuvenating water causes them to recover. The flowers also yielded some seed! I was sort of surprised about that. The name of these newly acquired hellebores is “HGC Jacob“, which is sort of an unwieldy name for a pretty flower. 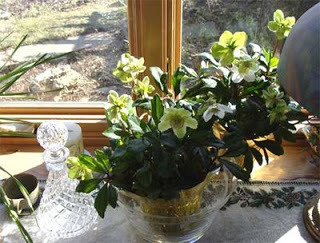 The “HGC” part of the name stands for “Helleborus Gold Collection”. 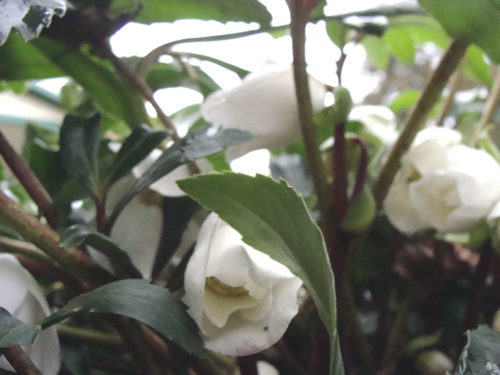 The Christmas rose’s Latin name is Hellborus niger. Of the Ranunculaceae family, related to buttercups and Trollius, and thus poisonous: “Parts of plant are poisonous if ingested”. It was used medicinally in ancient times, one of the applications being a treatment for insanity, but since it can cause cardiac arrest… I doubt if that is the way you want to end your mental distress. 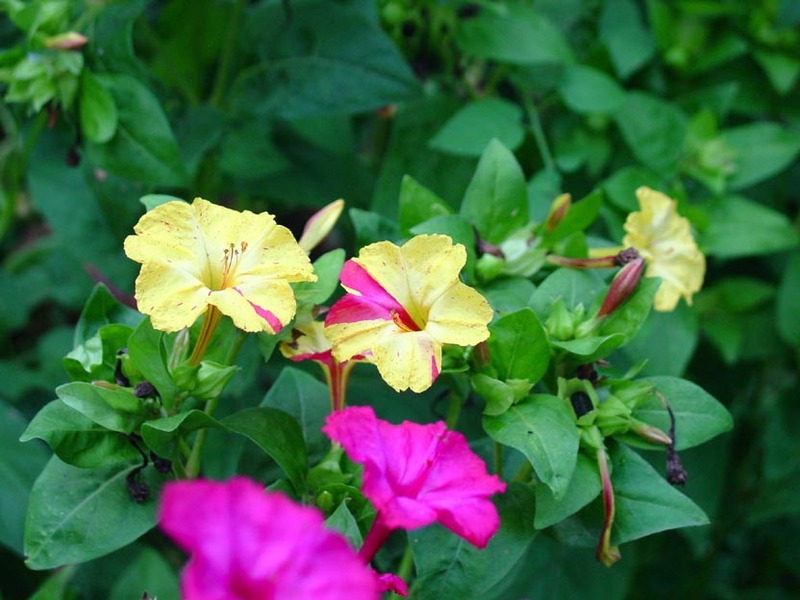 A better way is to look at the flowers blooming away with abandon at the bleakest period of the year. That will do your heart good, does mine! The growing conditions are part shade to shade, although some experts say full sun is fine. I bet that expert doesn’t live in the South, though. They like moist soil with organic matter, but my Lenten rose grows in a somewhat dry spot under a Maple tree. I do think it would be happier with more moisture, though. I think it is safe to say that once established these plants will tolerate and survive less than ideal conditions. Originally from areas with limestone soils, Helleborus niger should like my plot just fine. It is very hardy, to zone 4, which is highly encouraging to know. Buying plants on clearance is a favorite way of adding to my garden. My problem with indoor plants is always keeping them alive until spring, mainly due to allowing them to dry up- but the countdown to spring is on. I believe I may be able to plant these out in March if I harden them off a bit first. Regardless of their future in the garden, they have bloomed long and well inside my house, and that has been a pleasure.